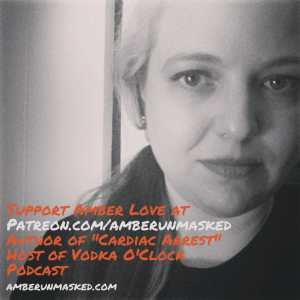 AMBER LOVE 01-NOV-2016 Posts like this are supported by backers at Patreon.com/amberunmasked. A few days ago I decided that I needed to do NaNoWriMo again — for my own sanity. 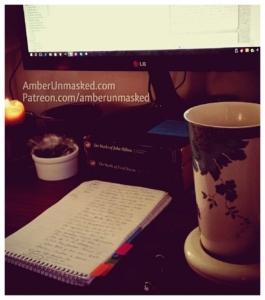 I have a quirky relationship with my own writing; once something is out of my head, I don’t want to revisit it which is why I hate editing so much and have two books in draft mode waiting for release schedules. I like the researching, development, and writing parts of “writing.” I’m aces at character construction and can spend hours trying to find a factoid nugget merely to mention in one sentence (today’s was about China patterns from the 1980s!). This year was going to be different no matter what. 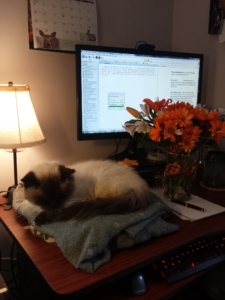 Last year and in 2014, Caico sat with me every day in her spot on the desk while I wrote. 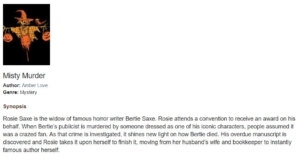 She died in January this year right around the time my first NaNoWriMo project was being released as a fully completed novel. Trying to adopt another cat was unbelievably harder than it should have been. I was trying to get another Himalayan or a Siamese which I’ve always wanted. The whole family was part of the quest. The applications were ridiculous (harder than to get a kid from Bulgaria). It took weeks to get the first steps of the Siamese Rescue done and the steps after that seemed like they would never end. Meanwhile, I kept going to shelters and checked Petfinder several times a day obsessively. We ended up deciding on a shorthaired black male and I named him Gus. He’s a good buddy for the whole house. He loves Oliver and spends time with everyone. But that’s what upsets me. I don’t need him glued to me, but I wish he’d spend more time with me. Some days I only see him for a couple minutes. Other days, he’s needy and attached. It’s very weird. But he’s healthy and seems very happy here. He just had his first Halloween as an inside family cat. 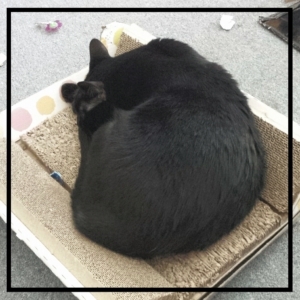 He won’t sit on the desk, but he loves this scratching box I got him when we first brought him home even though it’s pretty destroyed by now. So with cat in box near me, hot coffee on my mug warmer, a lovely scented candle burning, and a dish of chocolate-covered espresso beans, I was ready for day one. This year I was worried that I didn’t have any idea at all for a story. Then one day over the weekend, it began to formulate and it’s the first time I have the entire thing in my head. That doesn’t mean it’ll be easy. First of all, I am the worst typist so getting the words out of my head is a challenge; Secondly, I could still veer off course. I know the murder victim and I know who did it. Some of the details I haven’t worked out. I also already know the plot twists. Like last year, I already know that there are going to be “skip” days in November because of Thankgiving. 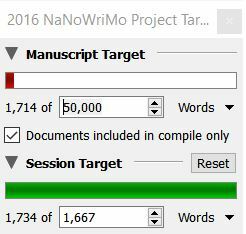 Now that this is my third year of NaNoWriMo, I know that I’ll have some 700-word days or 2,000-word days. It’s not a competition. It’s a challenge. It’s okay to “fail” at the word goal because it’s not really failing. I don’t know what the outcome of this story will be. Maybe I could go back to trying to get an agent since it’s not part of a series. I really have no idea yet. The important part is now, the writing of it. Hopes for agents and book deals can wait. I jotted down the story ideas as quickly as I could when it popped into my head that one day. I don’t use fancy Moleskines or bullet journals. I’m a longtime user of old fashioned steno pads. They’re comfortable to write in no matter how or where I’m sitting. Their downside is that there’s no organization to them. They’re strictly for immediate note-taking, but don’t expect to uncover something you wrote down six months ago. I did start using some colorful flags for that reason because I have every day notes on career stuff wedged in there. 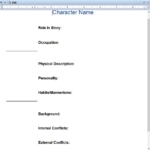 As you’ll find in my tutorials, I use Scrivener primarily. The only time I’ve gone into Word was this year in order to do the formatting of Full Body Manslaughter on my own. To prepare in Scrivener, I set my layout (where the panes are on the screen). 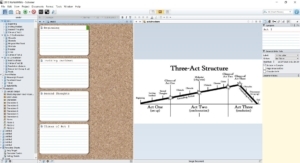 For outlines, I have the folder tree (which is what makes the chapters), the corkboard (virtual index cards), a nifty story act structure infographic, and then the inspector window. 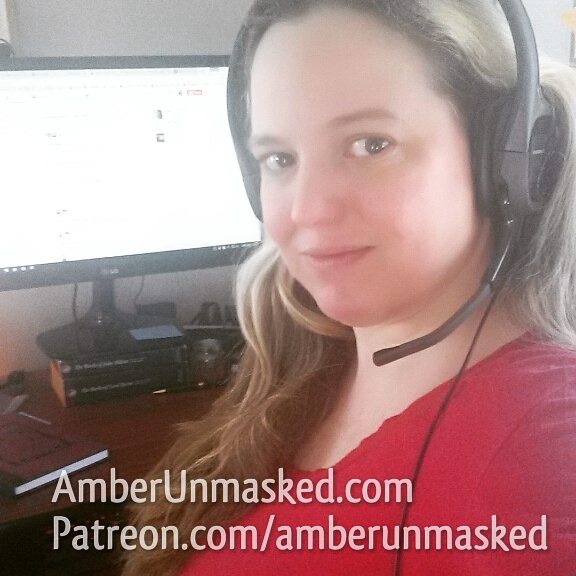 I made a bunch of chapter folders and added blank pages with the Daily Target Template page which automatically sets the target for 1,667 (what you need to write every day if you don’t have any days off in November to reach 50,000 words at the end). My folders were named with the story structure points on that infographic. I don’t know who made it, but I think I got it off of Wikipedia for three-act structure. There are tons of variants out there by professionals tooHelping Writers Become Authors. In this stage, before NaNoWriMo officially begins, you can also create your characters and places without breaking the rules of the challenge. 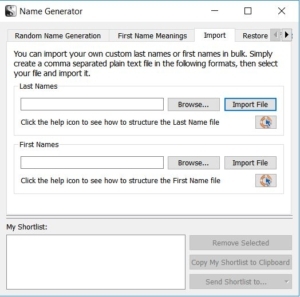 More and more I’ve used the built-in name generator which is found under Tools > Writing Tools > Name Generator in the Windows version. I still use baby name websites though. The problem is they lack some ethnic data that I would like to use once in a while like African names. I’ve had to specify that in google’s bar to get me to websites that aren’t all Anglo. The Scrivener name generator has definitely helped me with last names. You can also build up the database of names. It involves making a .csv file. I also LOVE LOVE LOVE to fantasy cast my characters. I need to visualize them in my head anyway when I’m writing, so it’s a wonderful way to treat my brain by doing something related to writing that’s fun and doesn’t have an impact on the final product. 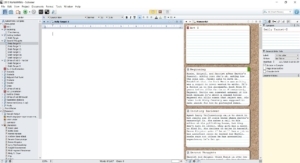 I set my layout in Scrivener for writing differently than for outlining. I have the file tree on the left, the working page, then the other editor where I toggle for the outline notes or character sheets, then the inspector pane. someone else started this group Pinterest board for people who love cozy mysteries and have a strong affection for their cover art. the ever-important “treat yo self” board of cocktails. my personal boards for the Farrah Wethers Mysteries: Cardiac Arrest, Full Body Manslaughter, and Miscarriage of Justice. It may look like they have duplicates, but it could be the preview images used linking back to different blog posts or links to Amazon, GoodReads, etc.